Veteran lighting designer Jeff Croiter recently deployed Martin by Harman lighting fixtures to create a new and contemporary lighting design for the Big Apple Circus. Established in 1977, the Big Apple Circus has been a mainstay outside Manhattan's Lincoln Center for decades, and has also traveled to countless cities on tour. In 2017, the circus was purchased by BigTop Works, who decided to update Big Apple’s traditional circus presentation to a Broadway-like spectacle. Management hired veteran Broadway lighting designer Jeff Croiter to create a bold and modern lighting design for the revamped show. Partnering with lighting vendor Christie Lites, Croiter designed a powerful and versatile lighting rig that features a range of Martin lighting solutions, including Martin MAC Axiom Hybrid fixtures, MAC Aura washes, and MAC Viper Profile fixtures. "We wanted the show to look incredibly stylized and sleek, like a modern circus—but not dark or uninviting," said Croiter. "Martin fixtures were a key part of the lighting design, and their versatility and durability were really helpful in creating the vibe that the circus wanted." 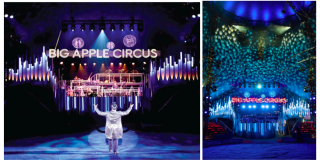 NYC's Big Apple Circus features numerous Martin by Harman fixtures. Croiter's design includes numerous Martin by Harman fixtures, including six Mac Axiom Hybrids, 28 MAC Auras, 32 MAC Viper Profiles, three MAC Quantum Profiles, and three MAC III Profiles. The fixtures are deployed in groups of six and four, on each of the four main tent poles. Fixtures are also hung on a suspended ring and accompanying truss that surrounds the poles, as well as three follow-spot platforms. "The circus is in a tent and the audience seated is in the round," Croiter said. “Each of the four tent poles or masts has a series of MAC Auras and MAC Vipers that are used to light the ring. Some are hung low so that they can shoot straight up and light the tent, turning it in to a giant cyclorama." Croiter had no previous experience with the MAC Axiom Hybrid before the Big Apple Circus, yet the versatile fixture ended up becoming an integral part of the lighting design. Croiter had initially asked for a different brand of wash light, but Christie Lites suggested he check out the Axiom Hybrid. After some research, Croiter decided to go with it and he never looked back. The durability of the fixtures was a critical consideration for Croiter—not only did they need to hold up under heavy nightly use, they also needed to withstand the dirt and dust that gets kicked up from circus floor. In fact, so much dirt gets displaced during each show that the circus has to cart in more every day. "I would see them back up a truck full of dirt and dump it on the ground, and I would think, yeah, everything's going to be dirty in one day," said Croiter. "They had to systematically and periodically clean the filters on the Vipers, and they were scraping mud off the back of them all the time. But I was amazed—we didn't lose a single Martin light. I was at the show constantly for the first month and a half, and I don't remember a Viper ever needing replacement. They all held up."